This is a virtual collection of Civil War letters written by Willis McDonald (1842-1918) of Co. F, 17th Connecticut Volunteers. Willis wrote all of the letters to his fiancee, Mary Esther Cole (1839-1922) of Norwalk, Connecticut. Although Willis was born and raised in Brooklyn, New York, he relocated from Brooklyn to Norwalk in 1858 where he began to learn the carpenters trade and where he formed his acquaintance with Mary Cole. 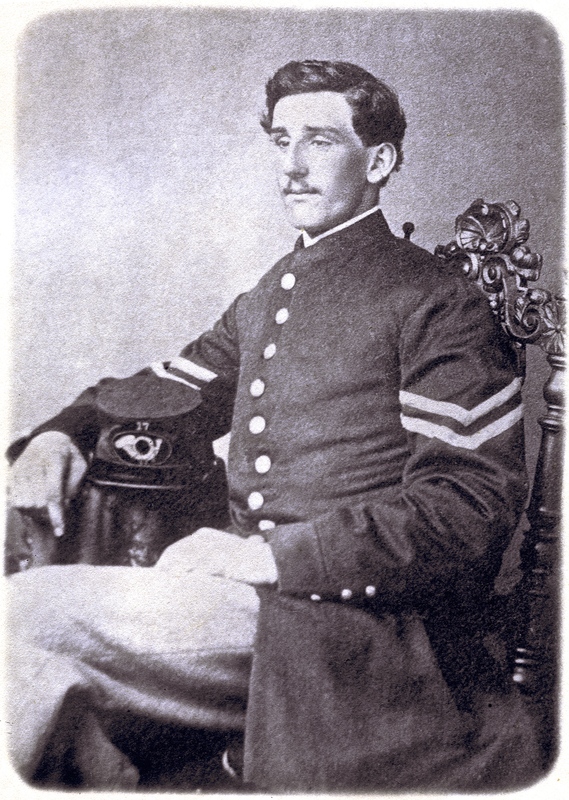 In “a spirit of uncontrollable patriotism, ” Willis enlisted in August 1862 and served three years with the 17th Connecticut (see Biographical sketch and Family Tree). The 17th Connecticut was organized from Fairfield County men in July 1862 and commanded by Colonel William H. Noble. The regiment joined the 11th Corps and saw heavy fighting at Chancellorsville and Gettysburg before transferring to the 10th Corps, Department of the South in Aug. 1863. At Gettysburg the regiment was the vanguard of Francis C. Barlow’s division marching to reinforce the fragmenting 1st Corps. The 17th CT advanced to Blocher’s Knoll coming under sustained Confederate artillery fire in which the regiment suffered 206 casualties in the ensuing fight and retreat to Cemetery Hill. The regiment later earned battle honors for the grueling siege operations undertaken at Morris Island and Fort Wagner (August 1863), and for Welaka, Saunders (May 19, 1864), and Dunn’s Lake, FL (Feb. 5, 1865). These letters date from November 1862 at the beginning of the regiment’s service in the field until mid-1865, while they were stationed at St. Augustine, Florida. These letters are better characterized as love letters and students of social history may enjoy them; those looking for battle content will be disappointed for the 17th Connecticut did most of its fighting at Chancellorsville and Gettysburg but there are no surviving letters giving accounts of these battles even though Willis was reported to have received a slight wound in the former. The 17th Connecticut never even crossed the Rappahannock River during the Battle of Fredericksburg in December 1862 though they came within earshot of the fighting. Editor’s Note: Subsequent to the publication of these letters, they were kindly donated by Carl Volz of Washington, Illinois, to the Bridgeport History Center, Bridgeport Public Library, Bridgeport, Connecticut.